Even though it seemed to polarize longtime Looney Tunes fans, what with its extreme departure from the classic Looney Tunes of yesteryear, I was a big fan of The Looney Tunes Show (2011-2014). That series only lasted two seasons and many viewers felt it was somehow disrespectful of the characters’ original conception. It recast the gang in a modern suburb and plopped them in the middle of storylines straight out of sitcoms. Bugs and Daffy are roommates and their neighborhood is populated by the rest of the Looney Tunes regulars. The whole thing was fresh, inventive, and had something for viewers of all ages. 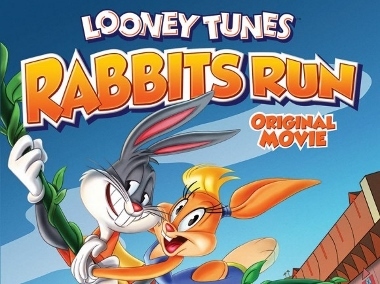 So it was with hopeful anticipation that I approached the new feature-length Looney Tunes: Rabbits Run, now available on DVD from Warner Bros. Home Entertainment. It has been nine years since the last all-new Looney Tunes film, Bah, Humduck! A Looney Tunes Christmas, and even longer since the last feature-length one, Looney Tunes: Back in Action (2003). There was no real reason that the irreverent spin found in the recent Looney Tunes Show couldn’t have carried over to Rabbits Run. Sadly, it didn’t—even though the film has been touted as something of a spin-off and/or follow-up to the now-defunct animated series. 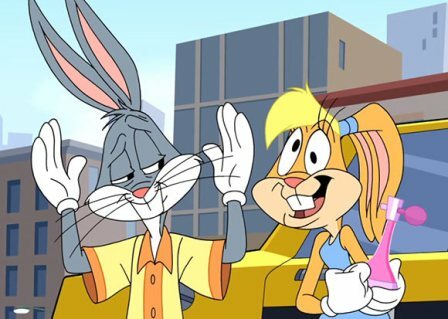 Maybe Warner should’ve brought in Looney Tunes Show creators Spike Brandt and Tom Cervone to write and direct (they’ve done some very cool things lately, including the recent Scooby-Doo! and KISS: Rock and Roll Mystery). As it is, Rabbits Run director Tom Siergey has a formidable background working on Looney Tunes projects, including having been a director on The Looney Tunes Show (he also worked on Back in Action and what might be Tunes‘ cinematic high point, Space Jam). Screenwriters Hugh Davison and Rachael Ramras both have experience on the episodic series as well. Ramras also voices Lola Bunny here, taking over from Kristen Wiig—who was, in fact, an Emmy nominee for her work voicing Lola on the series. But whatever the reasons, the movie doesn’t have the wit of the series. It also suffers from must have been a suffocating low budget—Rabbits Run just looks cheap, lacking any sense of visual style or adventure. As for the story, it’s a caper flick. Lola is trying to invent the world’s most intoxicatingly fragrant perfume. A government agency led by Foghorn Leghorn (Jeff Bergman, who voices multiple characters) is trying to capture a rare Mexican flower. This particular flower has the capacity to make someone invisible. Speedy Gonzales (Fred Armisen, returning from the series) manages to swipe the flower first, unaware of its invisibility-enabling power. Speedy gives it to Lola, who tries to turn it into perfume. Porky Pig (Bob Bergen) is sent to track down Lola, who finds herself on the run with cab driver Bugs Bunny (also Bergman). Sounds like it should’ve been fun – and, intermittently, it does deliver a few mild chuckles. Oh well, it’s short and kids who haven’t already experienced superior Looney Tunes material might still get a kick out of it. A handful of bonus cartoons round out the Looney Tunes: Rabbits Run DVD.